It’s always interesting to watch the different things that people do at graveyards. There were often customs and traditions that could be learned there too, if you watched long enough. Today Kachina watched as an older man was spending an unusual amount of time tending to one particular grave site. Eventually, the man hoisted into standing position what appeared to be a Christmas tree. She was familiar with the signs posted around the graveyard and she wondered how long the cemetery officials would allow it to remain. She couldn’t quite gauge the man’s age because he was too far away from her but she guessed him to be in his mid- to late sixties. Kachina continued to observe the gentleman retrieving water for the tree and the other flowers that adorned the grave. The man then spent several minutes knelt on one knee with his head down. “Is he praying?” she wondered. After a few more moments the man slowly rose and stood with his head still bowed. As he turned and walked away from the grave, his gait appeared tired and his head remained gazing only at the ground. Kachina continued to watch the sad, aging man as he walked towards a Jeep parked along the nearby curbside. Then she watched him get in and drive away. She continued to watch the car until it was out of sight. Since she had managed to get herself so wrapped up in this display of diligent and extensive care-taking, and being the nosy thing that she was, Kachina opted to walk over and get a closer view of this tree so tenderly cared for and painstakingly mounted. To her amazement, she found not only the little Christmas tree, decorated with lights and photos, but an entire nativity scene with additional trimmings. The set-up was even completed with sun-powered lighting! Gazing at the mock snow that lay on the ground, surrounded by a little white-picket fence, Kachina could only imagine how beautiful it would be at night. 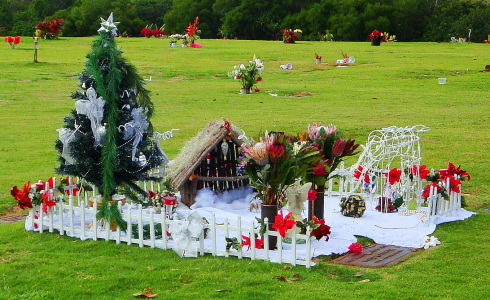 The photos on the tree only confirmed her suspicions — that this had been a husband caring for his wife’s resting place. The most amazing thing in Kachina’s mind was that this woman had actually passed away more than five years earlier. “I wonder,” she thought to herself, “if there will ever be a man who will love me that much and feel losing me quite that deeply?” Emotions pinched at her as she marveled at what the man must surely have been feeling. She brushed away a seasonal tear, crossed herself, and slowly walked away — oblivious that as she walked, she did so with her head held down. So, is it Fact or Fiction? It is a true story. Only the names have been changed to protect the innocent. I’m sure there are other stories like this one but they don’t always fall right into your lap. Sorry, I just had to share this. Sometimes real life actually can be as beautiful and moving as the stories we see on the Lifetime channel. Invitation to all writers! Or an invitation to anyone who can take a writing prompt and create around it, or, take a writing prompt and relate it to a post they’ve already written! This is a selection of lyrics from the Christina Aguilera song, “Candyman.” No, it’s not about a drug abuser/pusher, as one might think. It’s more of a little slutty piece about a bad boy — one that I found kind of amusing. We all know stories about a bad boy or two! Take it, run with it, create around it, and then submit it! I know there are many writer bloggers out there who post all about prompts! I’m open to submissions of prompts — in fact I would welcome a prompt for an upcoming edition of this Carnival! Pictures are good too! There is one blogger out there that has a great photo prompt — all about What I See Out My Window. They say a picture is worth a thousand words — check out what some people see outside their windows! You all might want to join in the fun over there too!